In the middle of downtown Salem sits a block that consists of a variety of businesses. Salem Fire Headqu arters, and a trio of public and private parking lots fill the space. 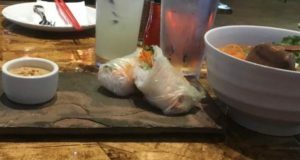 Included in those businesses are four restaurants, one of which, Passage To India we have previously reviewed. 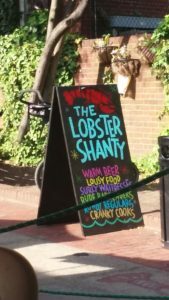 Today we review the second of those four restaurants, The Lobster Shanty. 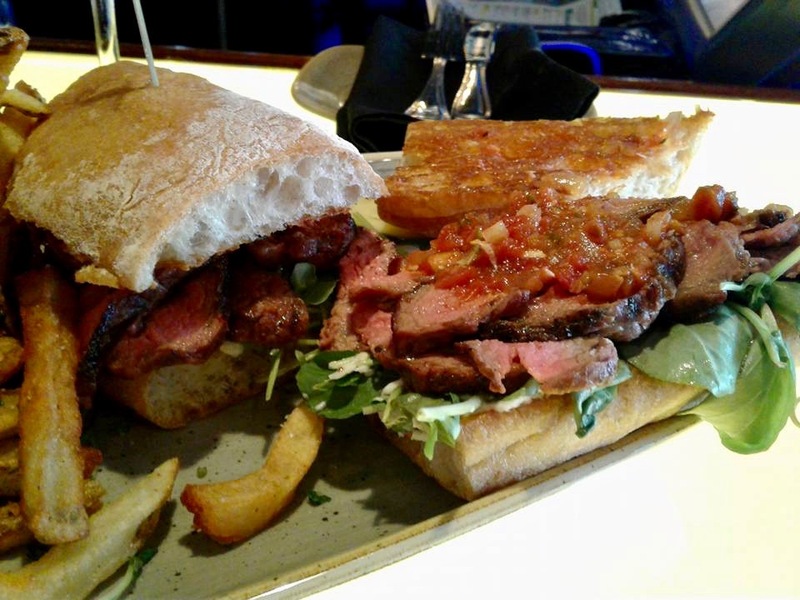 The Shanty has been a Salem fixture for over thirty years under four different owners. The legend of the original ownership group depends on who is posing as the expert. There are stories of lawyers, restauranteurs, and various rogue characters being involved. 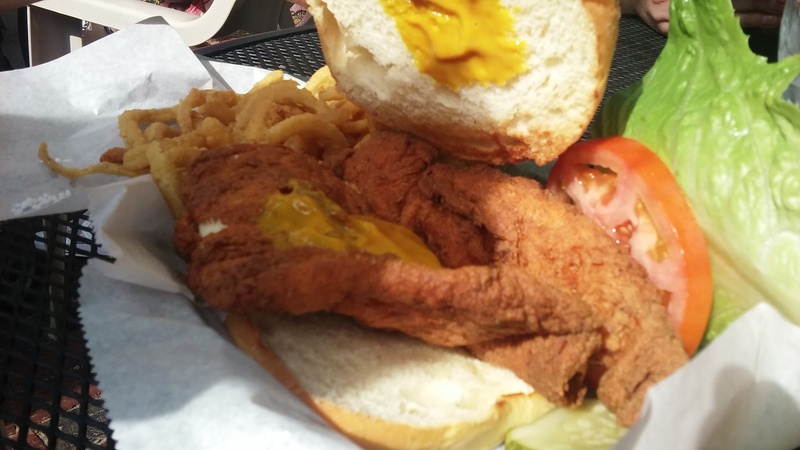 After a few years Bill and Betty Kelly bought it and it was they who over twenty years built the Shanty into a business that has drawn succeeding generations of “rowdy” regulars. 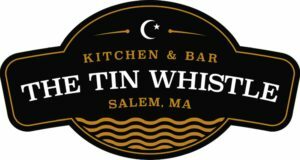 Those who have worked the floor, tended the bar, or tossed back a beer at the Shanty comprise a Who’s Who of the famous and infamous Salem characters. The last decade (and a little more) has seen two ownership changes with the most recent change proving to be more enduring than the previous one. 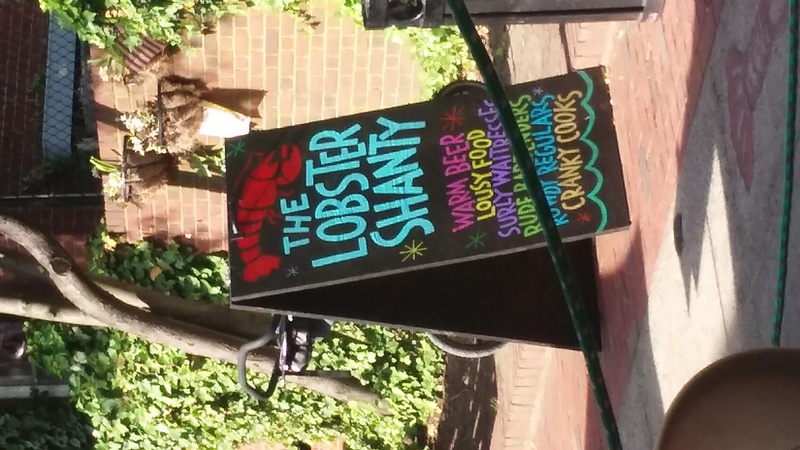 The Shanty has maintained a high level of popu larity and notoriety through appearances on a couple of well known television shows that feature restaurants. Our local professional crowd, and service industry workers consider it one of the required stops in their social schedules. We stopped by on a recent sunny Saturday to sample the wares and the atmosphere to decide for ourselves what to think. 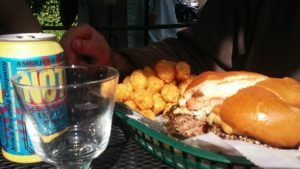 The BaldOne was there, and did in fact have a burger, but my participation in this review is only as the author. 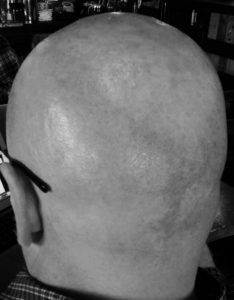 None of the thoughts or opinions detailed from hereon are mine. We depend solely on the words of the Queen Bee and Whiskey Willie. It should be noted that we visited the Shanty twice last year for review purposes but decided after the visits to forego a review for a later date. Sometimes that is just the right thing to do. The patio was busy, not quite full when we were seated along the ropes. It was a great spot for people watching due to the crowd that was there for the Salem Arts Festival. Bands, vendors, and the Mural Slam kept the crowd active. We started with some drinks, to include two tastes of Jefferson’s Bourbon and an Infinite Jest by Notch Brewery, soon to be Salem’s own locally produced beer. A couple of Mayflower Brewery products were also soon sitting on the table. Whiskey Willie ordered the Clyde Burger cooked medium. A Clyde is a ground beef patty coated in sesames seeds and cracked black pepper topped with blue cheese. His side was the tater tots. 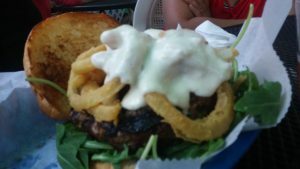 The Queen Bee also had a urge for blue cheese but she went in a different direction with the Blue Cheese Stuffed Burger. French fries were her choice for a side. 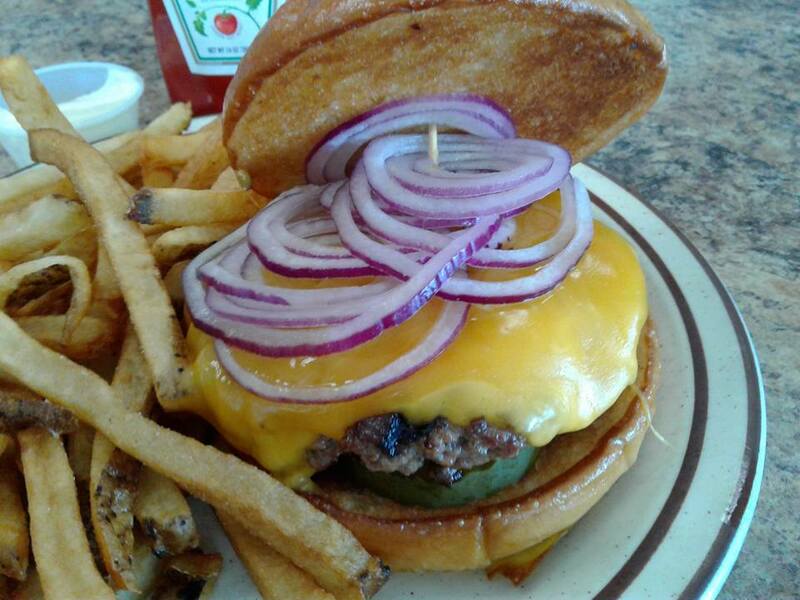 “Burgers are one of my go-to food items at the Shanty” said Whisky Willie. He feels that sometimes the menu is a little adventurous and finds the burger creations to be his preference. His patty was cooked a little past the medium that was ordered but he found the flavor of patty, coated in sesames seeds and black pepper good. He also added “I love the pickle chips” and was sure to compliment the Infinite Jest. Our very own Queen Bee usually likes her burgers medium-rare, but the Blue Cheese Stuffed burger takes some extra effort to prepare so medium is the lowest possible temperature. She noted the the meat “was cooked to perfection.” Queen bee found the burger to be “delicious” but was also quick to praise the house coated onion rings. The rings come as a topping on the burger itself. The fries generated their ow n discussion. They are not shoe-string, nor are they a steak fry. Cut thick and coated with a tasty but light seasoning, they have a crisp outside and a very soft inside. One table mate described them as very much like a fried mashed potato in texture. When all was said and done, Whiskey Willie felt that the service did not live up to it’s marketing hype of being rude and surly. “It was not the self-touted crappy, but was fine and attentive.” Queen Bee, while not disagreeing and acknowledging that things were busy, did have to wait a while for her food because it was initially delivered to the wrong table. Two others at the table dec lined to participate in the review, but we will note that the chicken breast used in the chicken sandwich that one of them enjoyed is fresh cut, thick , and breaded in-house. In this case, the third time was the charm and we can verify that the tradition of the Lobster Shanty, despite undergoing a period of physical and staff transition endures. Drop in and see for yourself.